This one I just had to share…… I adore leg of Lamb (a special treat from Jack at Jack O’Shea yesterday, yes he was in the shop but I promised not to tell too many people that he was serving!) and found an interesting recipe on the internet that I tinkered with. The end result was soooo delicious, you have to give it a go. Even my daughter and her veg-loving friend had seconds! Heat the oven to 230C/fan 210C/gas 8. 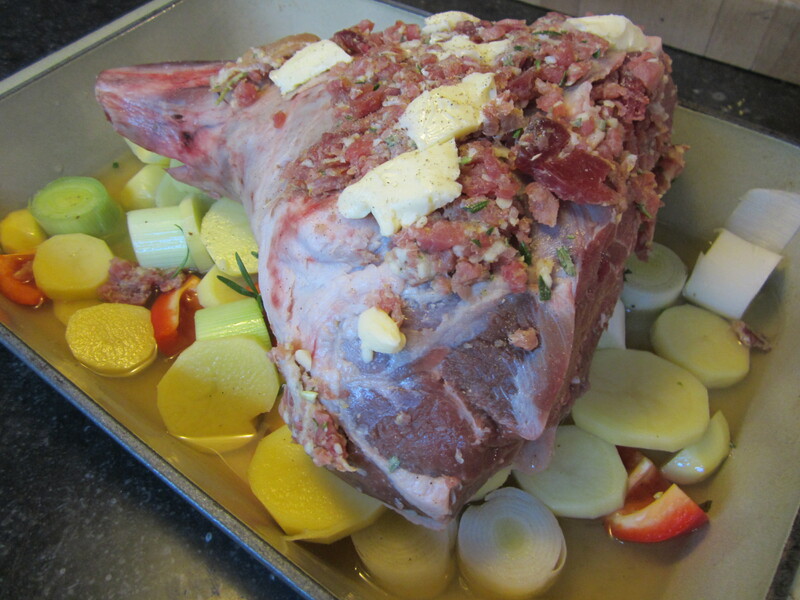 Start by making deep incisions all over the meaty side of the leg of lamb using a small knife. Whizz the Parma ham, garlic, lemon zest and half of the rosemary in a food processor. Season with pepper and using your fingers, push the mixture into the incisions in the lamb. Pull the rest of the rosemary into sprigs and push a sprig into each incision. Spread the butter over the surface of the meat and season well. Season the potatoes, arrange in a roasting tin and pour the stock around. Put the lamb on top and roast for 15 minutes. Turn the heat down to 180C/fan 160C/gas 4 and continue to cook for a further 1 hour and 15 minutes. While the lamb is cooking, make the gravy. Heat the butter and olive oil in a saucepan, add the onions and cook until golden brown. Add the flour and cook for a further 30 seconds. Pour in the red wine, bring to the boil and reduce by half. Add the stock, redcurrant jelly and continue to cook for 5 minutes. Season and serve with the lamb and potatoes. Next day I served the gravy with potatoes cooked in it, and the leftover meat heated up in it……… another family hit! The swiss chard cooked with garlic and chilli however on the side, was not so popular……..ah well, you can’t win them all. Thanks to… Leg of lamb cooked with potatoes recipe – Recipes – BBC Good Food. for the original recipe and lead photo. My guys were so hungry, and it smelt so good, that they dived in before I had a chance to take a shot! Lamb Recipes collection – Taste.com.au. looks like a great site from a nation of Lamb-lovers! | Jamie Oliver Recipes (UK). – the main man for Lamb! Jack O’Shea – Butcher | Home. – and where to source the best, London, Brussels, and soon to be Dubai! and do try out the WholeFoods app on the iPad….. it’s great for keying in the ingredients you have in the house and coming up with recipes! and they have Lamb!! ← Day 239 – Local Shopping for Young (by older!) Rock Stars….